I always like to share the fun stuff to be found at the Quilt Festival. I like to stock up on colorful supplies. 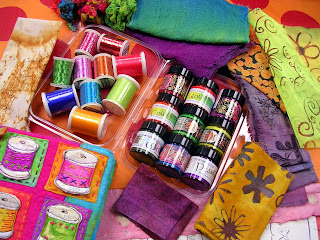 The top photo shows some Stewart Gill paints, Ricky Tims threads, Wonderfil threads, colorful ravelings, rusted fabric from RustTex, hand dyed cheesecloth, fabric from Wendy Richardson and some screen printed fabrics from Belinda Spiwak. 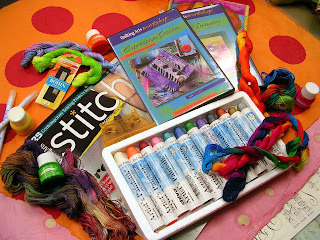 The bottom photo shows the new Stitch magazine from Interweave, Shiva painsticks, Tsukinenko Inks, hand dyed flosses from Laura Wasilowski and Wendy Richardson, Bohn sewing needles and needle threader and a couple of Quilting Arts Workshop dvd's. A great stash! Hi Kelli, I found your blog via Quilting Arts TV [unfortunately can't watch the TV shows as I'm in the UK :( ] but can view the projects. I absolutely love your use of colour and your gallery is so inspirational. Just wish I could have an imagination transplant LOL. I haven't seen the Stitch magazine yet. Must put that on my shopping list the next time I get to the bookstore. Man, you did some serious shopping! Can't wait till the fall when the show gets to Houston! Hey you! It was so nice to hear from you today on my blog! I was drooling over your latest Cloth Paper Scissors article just this week, thinking how lucky I am to have a few of your wonderful Mail Art pieces.